You are going to Watch One Piece Episode 434 English dubbed online free episodes with HQ / high quality. Stream Anime One Piece Episode 434 Online English dub All Forces Have Gathered! The Battle on Level 4 – The Burning Heat Hell! After the Minotaurus’ defeat, the floor gives way from the attacks Luffy and his companions used to defeat it, and they fall into Level 4. As Hancock leaves Impel Down, Momonga hears about Red-Haired Shanks fighting Kaidou in the New World to prevent him from attacking Whitebeard. 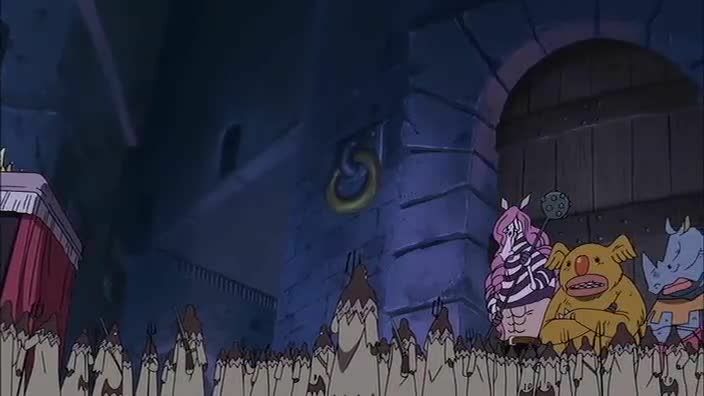 Magellan orders Sadie and the rest of the Demon Guards to guard the stairway to Level 5 while Hannyabal guards Level 3. Luffy and the others land in Level 4, managing to avoid being boiled in the sea of blood. Luffy and Mr 2. fight their way through the guards in search of food until Magellan intercepts them.